Suzuki Motorcycle India launched the special edition of the popular Gixxer and the Gixxer SF, in India, earlier this month. Suzuki has priced the 2018 Gixxer SP at Rs. 87,250 and the Gixxer SF SP at Rs. 1,00,630, ex-showroom, Delhi. A new video shows that the bikes have started arriving at Suzuki dealerships around India. Both the bikes get many visual updates but remain unchanged mechanically. The bikes are only available in a single variant and are based on the top-end variants of the bikes. The Gixxer SP gets ABS as standard, while the Gixxer SF SP is based on the variant that gets fuel injection and ABS as standard. It should be noted that Suzuki is yet to launch the fuel-injected version of the Gixxer naked bike in the market. Both the bikes get a new special colour scheme and more aggressive body graphics that differentiate them from the regular models. Everything else including the features and power output remains similar to the regular versions of the bikes. The SP editions get a new gold and black colour combination that makes it look quite unique. The bikes also get a special badge that says “SP 2018”, which makes them different from the regular versions. Suzuki dealerships around India started taking the bookings of the bikes when it was launched on 9th July 2018. Now that the bikes have started arriving at dealerships, the deliveries are expected to begin soon. Both the bikes are powered by the 155-cc, single-cylinder, air-cooled engine. Both the carburetted and fuel-injected versions of the engine produces a similar 14.6 Bhp at 8,000 rpm and 14 Nm of peak torque at 6,000 rpm. The Suzuki Gixxer naked bike takes on the likes of Honda Hornet 160R, Yamaha FZ-S, Bajaj Pulsar 160 and the TVS RTR 160. The Suzuki Gixxer SF is the fully faired version of the Gixxer and gets no direct competitors in the segment. 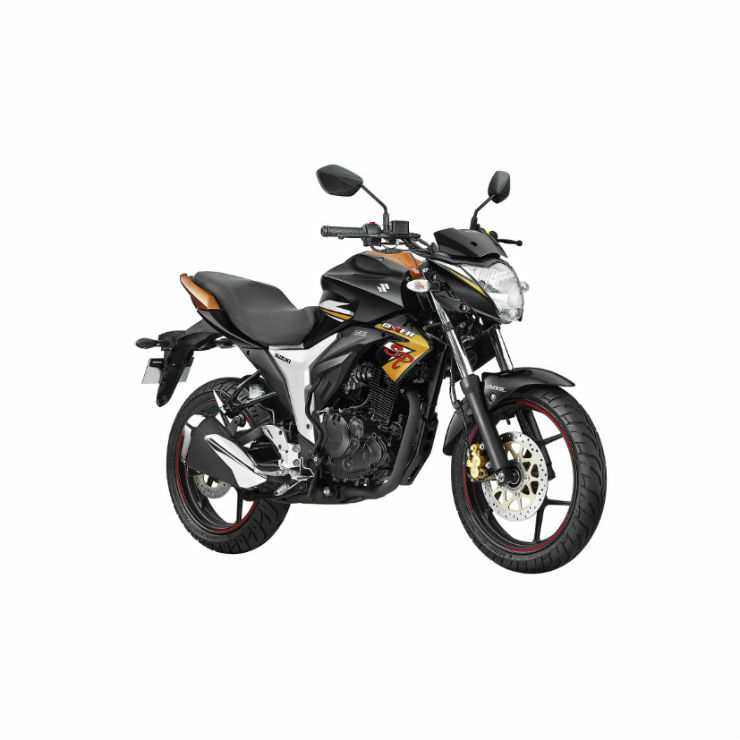 However, engine capacity wise, the bike takes on the Yamaha YZF-R15 in the market. The Gixxer twins are the best-selling products in the market and are known for their sharp looks and smooth engine. Both the bikes get a twin-exhaust muffler and sleek design.